Originally founded by Canary Islanders in 1731 (although a small Indian community had already been established in the San Pedro Springs area called Yanaguana), San Antonio de Béxar was an early Spanish settlement in the Americas. Most Texas roads lead to San Antonio. The city has the distinction of being part of six different nations during it's long history: Mexico, Spain, France, Republic of Texas, Confederate States of America and United States of America. The area now called San Antonio was home to the Indian tribe of Coahuiltecan until the 1700's. Here the Mission San Antonio de Valero (The Alamo) was founded in 1718. The city of San Antonio built up around this humble mission. The mission was eventually abandoned. It became the site where militia and pioneers like Davy Crockett and Jim Bowie bravely held off the Mexican forces led by Santa Anna, and were defeated 13 days later. This defeat and the battle cry, "Remember the Alamo!" took the US forces, led by Sam Houston, to defeat the Mexican Army three months later. San Antonio became a speakeasy type of town in the late 1800's. It became a place of gambling, prostitution and gun fighting. It also became the center of exodus for many European settlers, mostly German. The Germans particularly, did well in selling and trading. They amassed much wealth and built up a strong merchant community, driving much of the criminal element out of the city. The area called King William Historic District (See things to see guide) has become an architectural monument to these hard working immigrants. In the mid-20th century the Works Project Administration (WPA), a federal government program which helped jobless citizens, also helped to save the face of San Antonio. They picked op on architect and San Antonio Conservation Society member Robert Hughman's 1927 design for the river and various points around the city. The workers followed the basic blueprint for what would become the Riverwalk, Japanese Gardens and Theatre and the Arneson Theatre. The landscaped river and other projects sat on the shelf for another 27 years until the 1968 HemisFair, celebrating the 250 year anniversary of the city, came to town. The HemisFair brought the completion of Riverwalk, with all of its shops, restaurants, malls and hotels. It also brought Japanese Gardens, miniature trains, a 750 ft. tower and restaurant, and a theatre (Arneson) with a river where the orchestra pit should be. So much development followed that you might not recognize a picture of the city just 25 years ago. 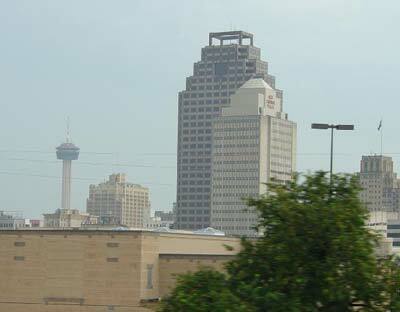 Today San Antonio is a bustling urban city, the eighth largest in the United States with over a million residents. Tourism and industry drive the city's economy. San Antonio is the second largest military town in the United States, rivaled only by our nation's capital. Four military institutions call San Antonio home. San Antonio has a large Hispanic community and it is shown with pride, culture, and architecture and in almost every other facet of life in San Antonio. Today, the city's easygoing atmosphere can't hide the fact that it's a major trade zone and a nationally known college town, with significant reserves of petroleum, livestock and beer. The city is also a major tourist drawcard, with hospitality the number two employer after the medical/biotechnology industry. The military comes in at third place. The mission was authorized in 1716 by the viceroy of Mexico. It was established two years later in 1718 by Fray Antonio de Olivares, who brought Indian converts and records with him from the San Francisco Solano Mission near San Juan Bautista on the Rio Grande. Olivares named the mission after St. Anthony of Padua and the Duke of Valero, who was viceroy of Mexico at the time. The present site was selected in 1724 and the cornerstone was laid on May 8, 1744. The Alamo was the first in a chain of missions established nearby along the San Antonio River. Several of these other missions have been preserved as part of San Antonio Missions National Historical Park. After 1765, the missionary activity began to wane and in 1793 the mission was abandoned, with the archives being removed to nearby San Fernando Church. In 1803, the abandoned compound was occupied by the Second Flying Company of San Carlos de Parras, a company of Spanish soldiers from Álamo de Parras, Coahuila, Mexico. It is believed by some historians that the name "Alamo" derives from this. An alternate theory of the origin of the name is that it derives from the Spanish word álamo (cottonwood), after the grove of nearby trees. The building was occupied by Mexican forces almost continuously until December 1835, when it was surrendered to Texan forces by General Martín Perfecto de Cos. Two months later, on February 23, 1836, Colonel William B. Travis entered the Alamo with a force that later totaled approximately 187 men. Approximately 5,000 Mexican soldiers under the command of General Antonio López de Santa Anna laid siege to the fortress for 13 days. The siege climaxed on March 6 and resulted in the death of most Texan defenders. After the siege, the building was nearly in ruins. Little attempt was made to restore it, and on January 13, 1841, the Republic of Texas passed an act returning the church of the Alamo to the Roman Catholic Church. After the annexation of Texas, the United States claimed the ruined building, which was used for quartermaster purposes by the Army until the Civil War. During the Civil War the Confederacy used the building, but after the war, the United States government reclaimed the building and used it until 1876. The ownership of the building was in dispute for much of the later half of the 19th century. In April 23, 1883, the State of Texas officially purchased the church building from the Catholic Church and gave to the city of San Antonio with the provision that the city should pay for the care of the building. From the 1890s through 1905 two women made themselves responsible for the preservation of the site: historian and teacher Adina De Zavala, and philanthropist Clara Driscoll, who acquired the site with her own personal funds. The two women later clashed over the treatment of the convent. Driscoll wanted it torn down. On January 25, 1905, the Texas State Legislature passed a resolution purchasing a part of the mission occupied by a business concern, with the further instruction that the purchased property and the church be given to the Daughters of the Republic of Texas, who are currently in custody of the buildings. Disputes over the ownership of the compound persisted throughout the 20th century. In 1908 De Zavala barracaded herself in the building for three days in a successful attempt to prevent commercial exploitation. The building has been restored on several occasions, most notably for the Texas Centennial in 1936.